The Targus DEFCON SCL (Serialized Cable Lock) is a serialized lock with a pre-set combination. It is sold in multiples of 25 under model number PA410S. This Targus laptop security product finally provides a computer security solution for complete asset protection. 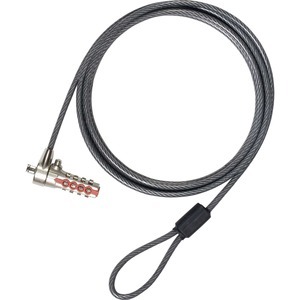 The Targus DEFCON Serialized Cable Lock (SCL) is 6.5 feet of cut-resistant, galvanized steel cable that loops around any secure object and easily attaches to your laptop computer's lock slot. Our DEFCON SCL features a pre-set combination lock in which your IT Manager has access to all combinations via a secure password protected web site. The DEFCON SCL is the first laptop computer security product to offer the benefits and convenience of a keyless security solution.